Though we're well into the month of November here in Key West, fishing is better than ever, with a plethora of hauls this week that were truly spectacular. 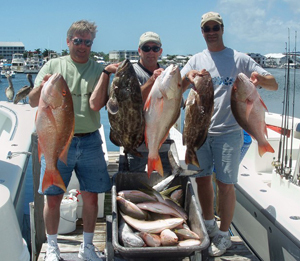 These catches were recorded on a myriad of our Key West fishing charters, from deep sea fishing to light tackle fishing. While there were plenty of noteworthy catches throughout the week, only one was able to land the spot as the Key West Catch of the Week. This award goes to an amazing haul of a huge Black Grouper weighing in at around 60-70 pounds. This fantastic catch was reeled in by Russell of Pittsburgh and was easily the highlight of this past week. Russell was visiting Key West for some last minute warmth before the winter season hits his hometown, a getaway that was surely bolstered by this magnificent catch. 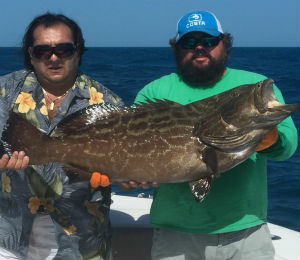 The Black Grouper is one of the most popular species of Grouper fish and is highly sought after by anglers in Key West for both food and sport, as the fish is one of the tastiest around. Black Groupers are typically rather largei n size and can grow up to over 200 pounds. It's clear that Russell had his hands full with the massive 60-70 pound Grouper he had to reel in while keeping it on the line. Black Grouper are usually identified by anglers looking to catch them by their grey bodies that are covered with black spots. Their ray-finned tails are also commonly tinged at the end with black, making them distinguishable among other species of Grouper. Though Black Groupers can be found in many portions of the Atlantic Ocean, they are at their most bountiful in Key West and can typically be found swimming among coral reefs and seaweed, especially when they are feeding. This species of fish tends to feed on squid and smaller fish, as well as shrimp when they are younger. When traveling on one of our many Key West fishing charters, you will find that Black Grouper are one of the stronger species of fish out there, as they make up for their lack of speed with brute strength that will test your endurance as you're attempting to reel it in. 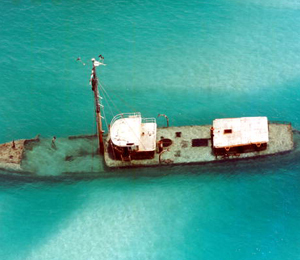 While Black Grouper can be caught in any weather condition and at any time of the day, the catch is made easier by attempting to snag one, or several, directly after it's rained. This is usually the time when Black Grouper tend to feed, making them much easier prey. It's important to note that this species of fish is a more solitary one and doesn't swim in schools. The weather this week was perfect at high 70's and low 80's for the most part, allowing the warmer waters to facilitate the catching of this fish. 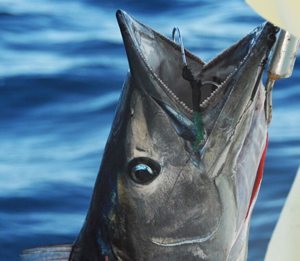 If you would like to see if you have what it takes to haul in a catch worthy of the Catch of the Week award, don't hesitate to drop by Key West where the fishing season never ends.